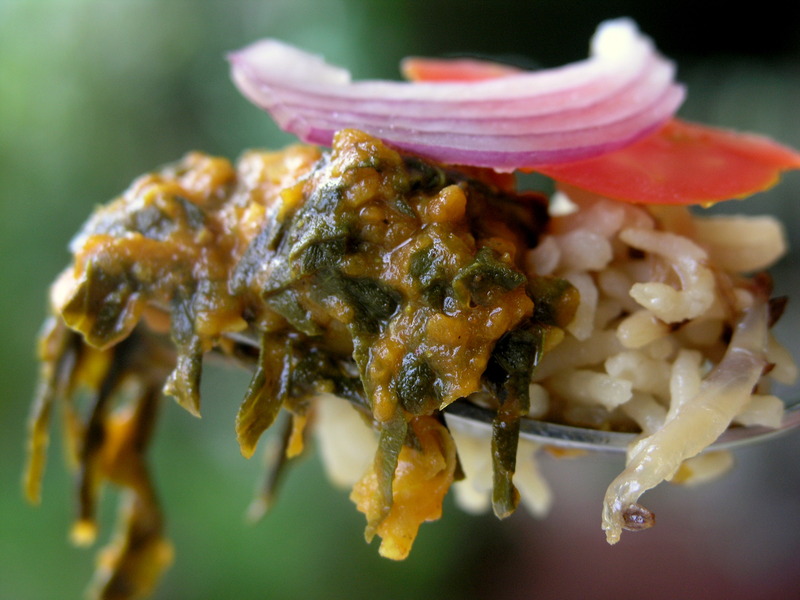 I adore spinach (palak) based curries and, fortunately, there are so many in Punjabi cuisine. We love our chicken palak, mutton palak, palak paneer, saag aloo, and the mother of them all, sarson da saag, which is traditionally made from mustard greens (sarson) blended with a little spinach, but also tastes delicious when made purely from spinach. My mum was travelling through the Punjab the other day and stopped off at a dhaba, following a visit to the beautiful Golden Temple in Amritsar. A dhaba is a rustic roadside restaurant, traditionally found along the highways of Punjab, serving hearty home style cooking; you are guaranteed to find at least one palak based dish at a dhaba! You can now find urban dhabas all over the world (and not a highway in sight), trying to recreate a sense of rustic Punjabi cooking. 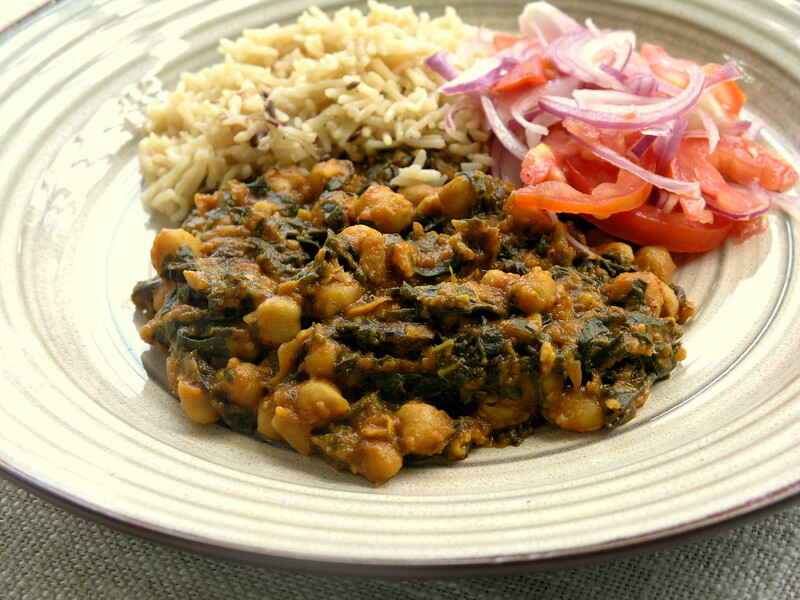 My mum said that she had delicious palak chole with paronthas at the dhaba and it reminded me of a time I had made this dish for vegetarians alongside a chicken palak dish I was making for the omnivores. It is delicious and a lot less common on Indian menus than the aforementioned palak dishes – and I don’t know why! Yesterday evening I told my dad I would be making a healthy version of palak chole for lunch today and was met with a less than enthusiastic grunt! Well, he is now resting in an armchair reading the newspaper, looking like the cat that got his cream! He loved it and he knows his palak curries, because he makes excellent chicken and mutton versions himself. Here is my healthy and very tasty version. I made mine from dried chickpeas, which I soaked in water and 1/2 a teaspoon of baking powder overnight (almost 24 hours, actually), rinsed thoroughly, and then pressure cooked for 20 minutes. If you cook them in a standard pot on the stovetop it should take about 1.5-2 hours of simmering. Canned chickpeas will work fine – I know that many of you are pressed for time or…ahem….just can’t be bothered! 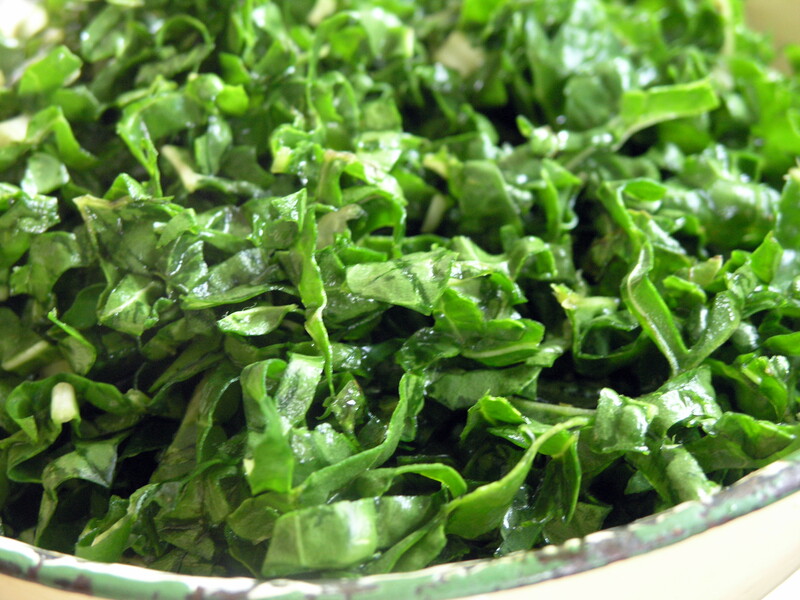 Finely chopped fresh spinach, gloriously verdant! Use a large non-stick wok or pan. from time to time until the onions caramelise into a medium brown colour. This will take 5-6 minutes. If it browns too quickly, add a tablespoon or 2 of water to slow the process. Add the spinach, fenugreek (if using), coriander powder, cumin powder, cardamom powder, turmeric, chilli powder and salt and stir well. Add the 2 cups of water, increase the heat to bring to a boil and then lower it and simmer this mixture for 15 minutes until most of the water has evaporated and the spinach and tomatoes have come together into a thick, fragrant curry. Serve with rice or chapatis and a tomato and onion salad dressed with lime juice! Per serving: Calories 321, Protein 15g, Carbohydrate 50g, Sugars 11g, Fat 9g, Saturates 1g, Fibre 13g. A good source of Dietary Fiber, Vitamin C, Iron and Copper, and a very good source of Vitamin A, Vitamin K, Folate and Manganese. This is off to Ricki’s fabulous Wellness Weekend June 7th-12th. A forkful of delicious goodness! I came across your wonderful recipe this week and decided to try it out, I am always looking for different vegetarian dishes for my family to change things up a bit. This was so delicious. I put it in a wrap and then grilled it. I served it with a little plum sauce for dipping. I had had a chicken palak served that way at a cafe and decided I needed to make my own at home! This was perfect! Thank you from one grateful Canadian family. Ashfaq, thanks so much! You are one of the people who have inspired me when it comes to eating healthy and exercising regularly and enjoying the results it brings! It totally is possible to eat tasty, healthy, Indian food! I hope you try it and enjoy it! That’s wonderful Bansi – do let me know how it turns out! Thanks so much for passing on the message Simran! Will be calling maasi to find out what that means for sure! Miss you all. Another fantastic recipe Cheeks, great story telling and fantastic pics. You, my dear sis, are a STAR. I want more and more and more! You know it Ron – the white arm chair in the Veranda! Thanks for your unrelenting support Ron! Thanks so much Beenu – your support means so much. This is a really easy recipe and you can use all the shortcuts possible – canned chickpeas, chopped tomatoes, frozen chopped spinach – it will take no time at all! I will do my best to create more, more and more healthy but tasty recipes!